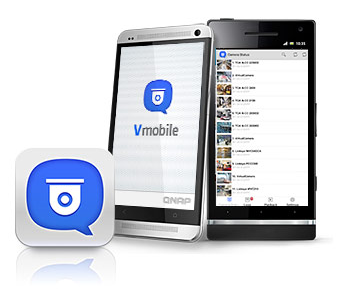 The Vmobile mobile app enables you to monitor the Surveillance Station anytime and anywhere using iOS and Android devices. 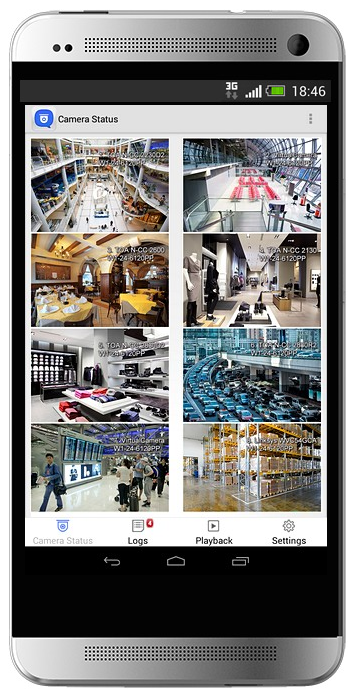 It provides camera live-view, PTZ control, instant event notifications, video snapshot, video playback, and video search by date and time. 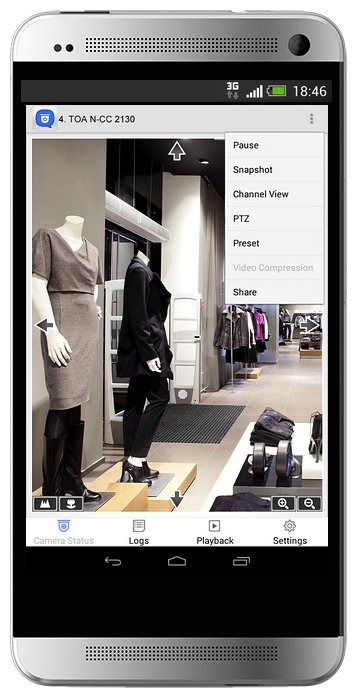 The Vcam mobile app can turn your mobile device into a network camera. 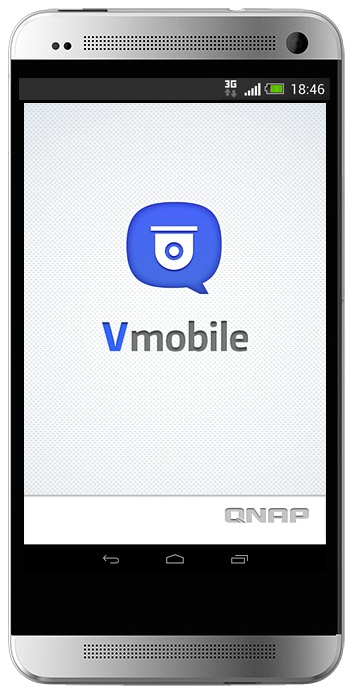 With the Vcam mobile app, you could record any moment around you to your Turbo NAS. 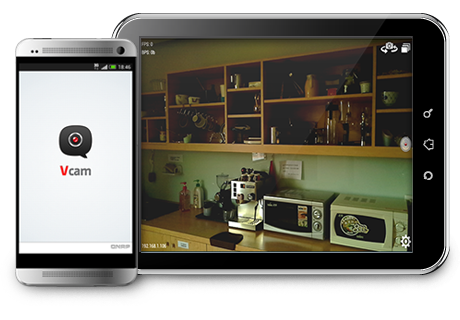 The Vcam solution provides a great way to deploy a home surveillance system without purchasing expensive IP cameras. 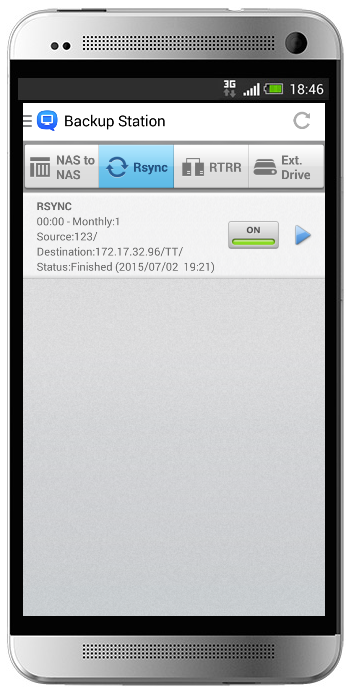 Ever wanted to browse and manage files stored on your Turbo NAS with your iOS®, Android™ and Windows® mobile device? 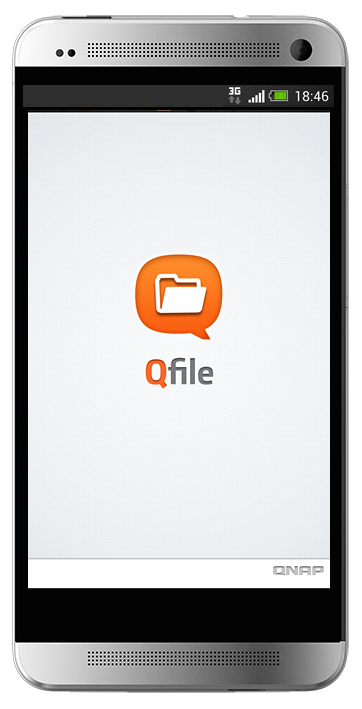 The free Qfile app is right for you. 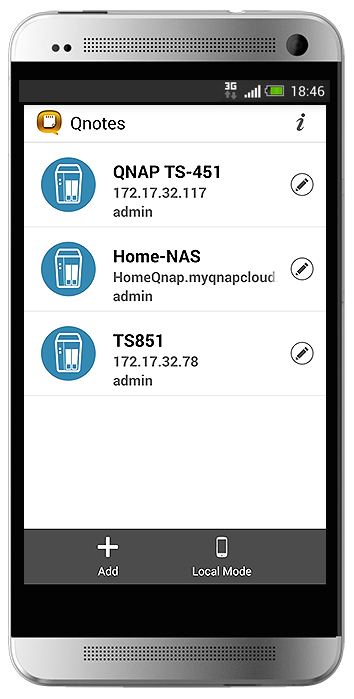 Add as many Turbo NAS units in the Qfile and conveniently connect to any of them in the log-in page. 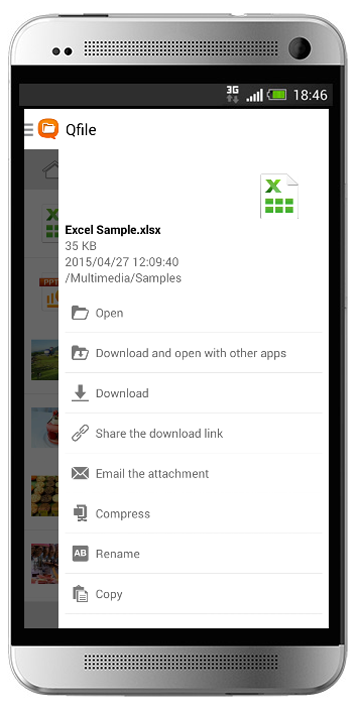 The file thumbnails help you easily identify the file type at a glance. You can move, copy, rename or delete files on the Turbo NAS without computer required. Browse and play the music, photos, and videos on the Turbo NAS. 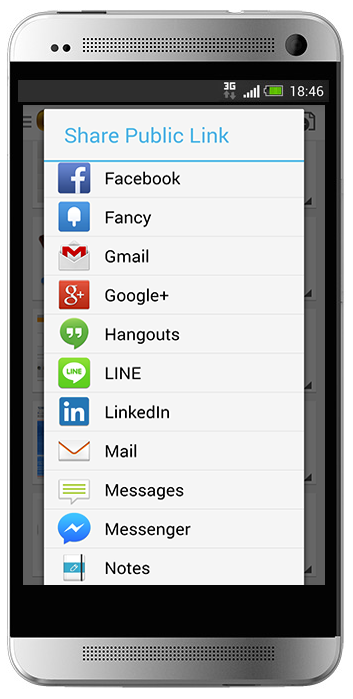 No more worries about the space limitation of your mobile device. Automatically upload photos to your Turbo NAS whenever you take new photos. 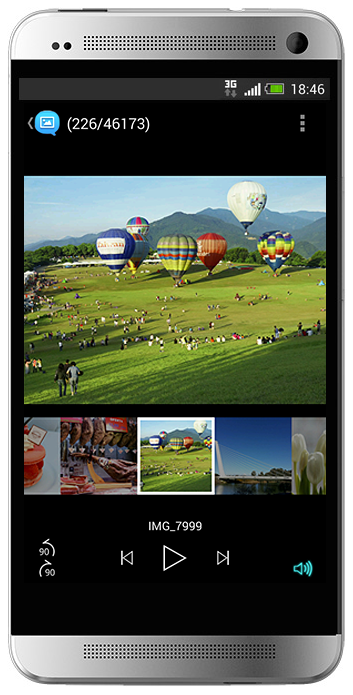 It works as a real-time backup of your precious photos. Download documents, photos or music from the Turbo NAS to your mobile devices for offline reading. 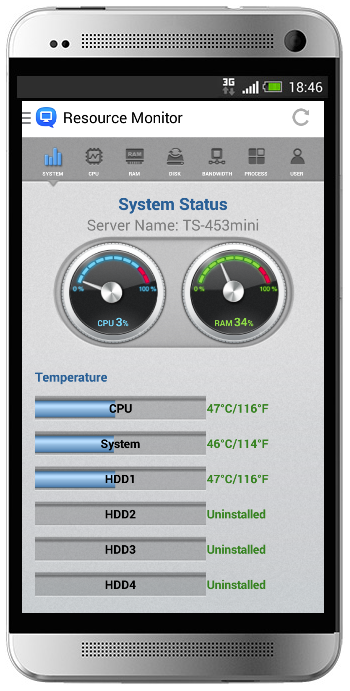 Ever wanted to monitor and manage your Turbo NAS with your iOS® or Android™ mobile device? The Qmanager app makes it easy. 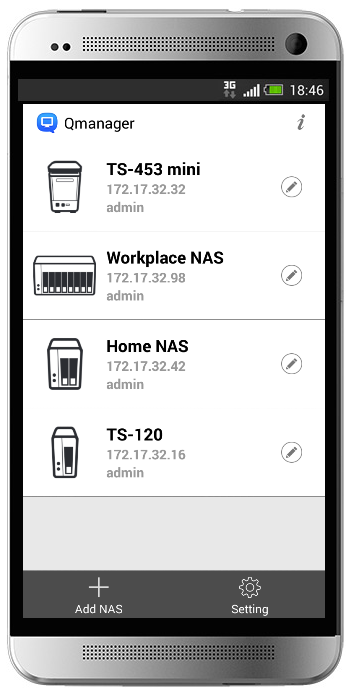 Add multiple Turbo NAS units on Qmanager, and conveniently manage anyone of them, anytime and anywhere. Restart or shutdown your Turbo NAS remotely. 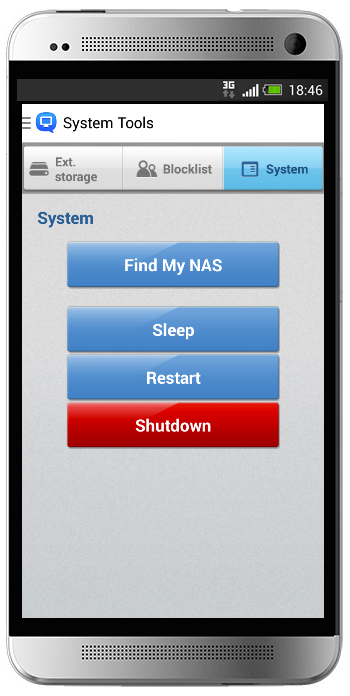 Easily turn on/off application services of the Turbo NAS via Qmanager. It only takes one click! 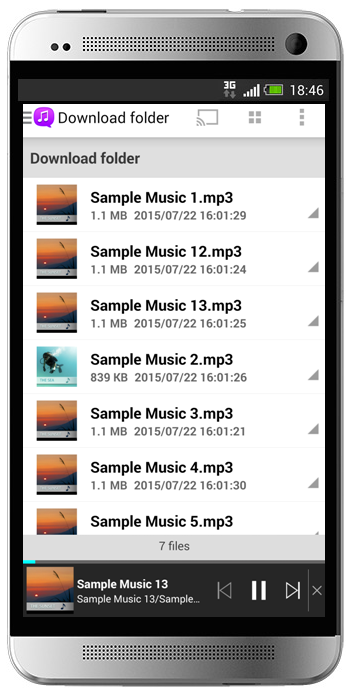 Ever wanted to stream and enjoy the music stored on your Turbo NAS with iOS® and Android™ mobile device? 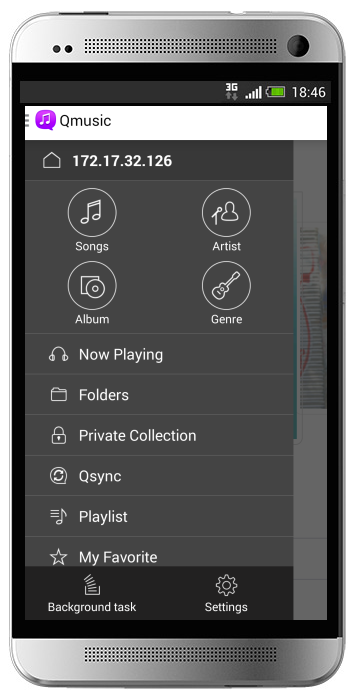 The free Qmusic app allows you to listen to your terabytes of music collection on the Turbo NAS anytime and anywhere. Easily connect to the Turbo NAS and play the music collection with simple operations. It’s 1-2-3 to have a mobile music box! 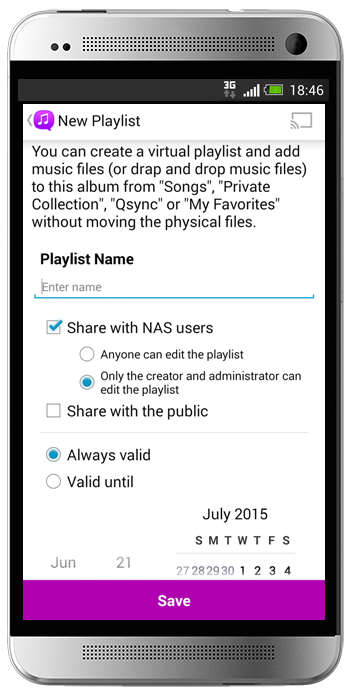 Browse music collection on the Turbo NAS by song, singer, album, or folder. 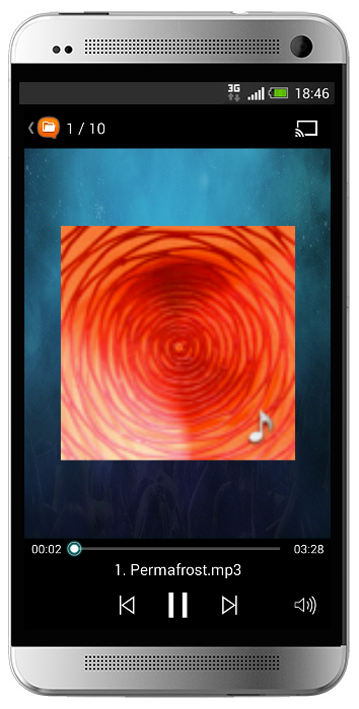 Click the “Download” button to instantly download the music on the Turbo NAS to your mobile device for offline listening. The music never stops even when the Internet is not available. 4 ways to play the music immediately: Random song, Random playlist, My favorite, and Recently added. 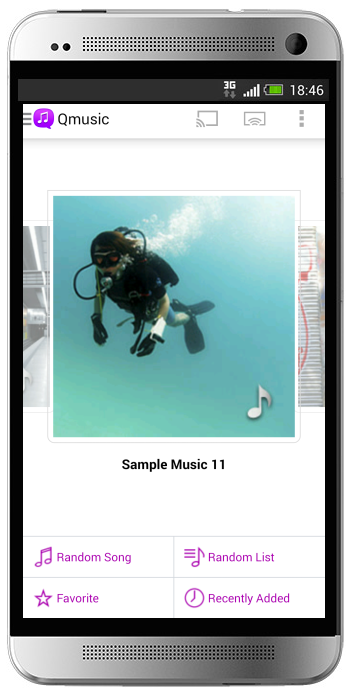 You can easily create playlists, edit the playlist contents, or add the songs in the “Now playing ” list to the playlist. Search songs by title, album, or artist to find the right tracks for your mood. The Qphoto app allows you to easily browse and share the photos on your Turbo NAS anytime and anywhere with mobile devices. 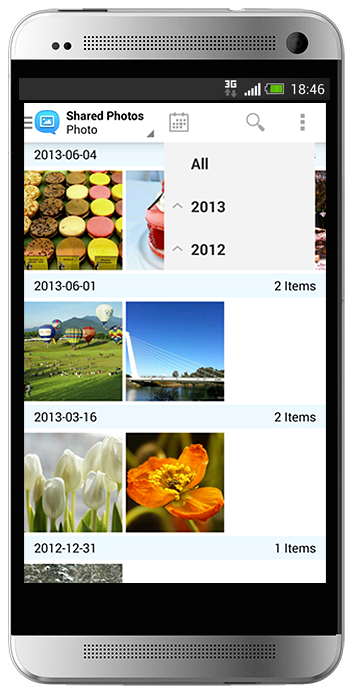 Browse your photo collection using a timeline view, thumbnails, detailed list and folders. 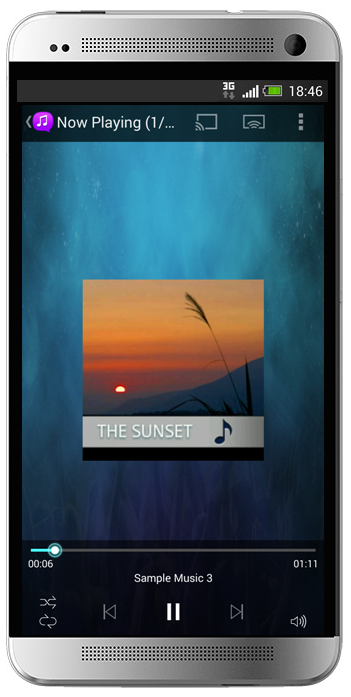 Create and enjoy slideshows with photos and background music from your mobile devices. 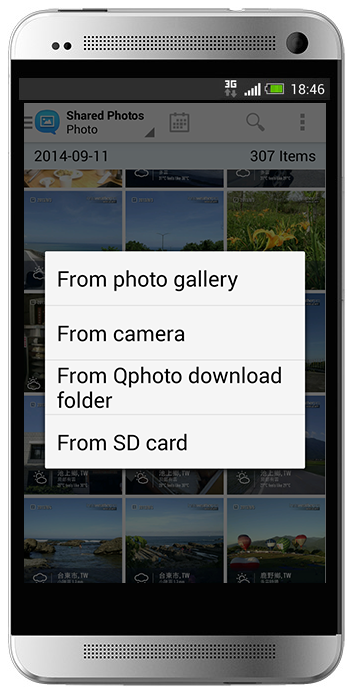 Upload photos directly to your Turbo NAS from your device camera and gallery or the inserted SD card to save your great moments. Archive personal photos in the password-protected “Private Collection”. Your private photos cannot be accessed by other Turbo NAS users. 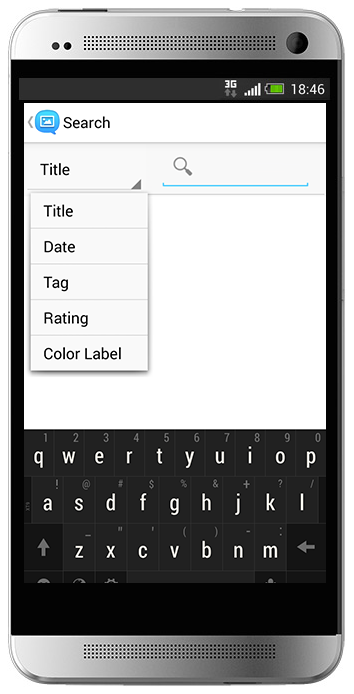 Use keywords or tags to easily find specific photos & videos on your Turbo NAS. 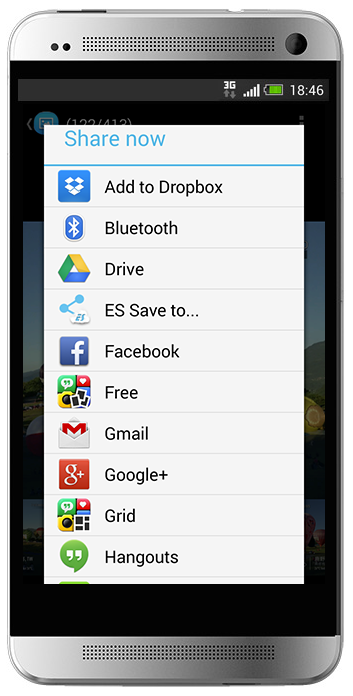 Share photos from your Turbo NAS via Facebook, Twitter, Google+, WhatsApp, Line, Instagram, Gmail, and more. 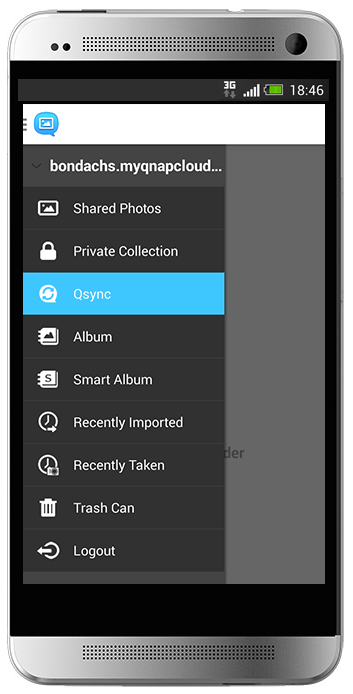 Qphoto supports Qsync that synchronizes files between Qsync-enabled devices/applications and a Turbo NAS. If photos or videos are accidentally deleted from your mobile devices, you can still retrieve them from the “Trash Can” folder. The free Qvideo app allows you to enjoy and share the video collection stored on your Turbo NAS from mobile devices anytime and anywhere. 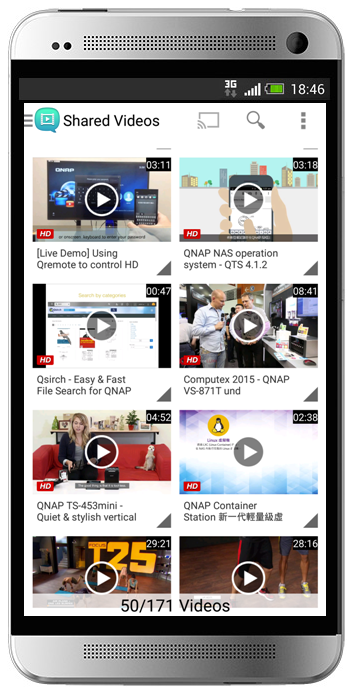 Watch any of the videos stored on your Turbo NAS using mobile devices at anytime, anywhere. 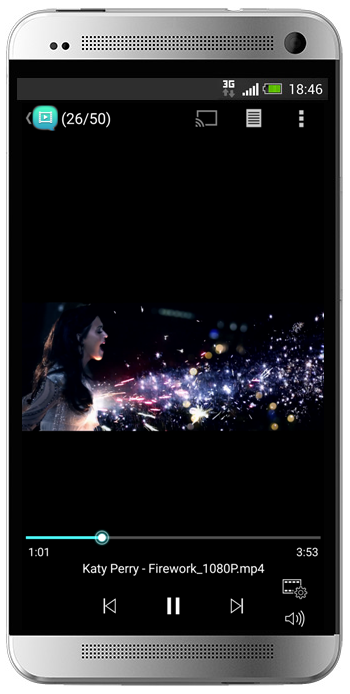 Browse your video collection using a timeline view, thumbnails, detailed list and folders. 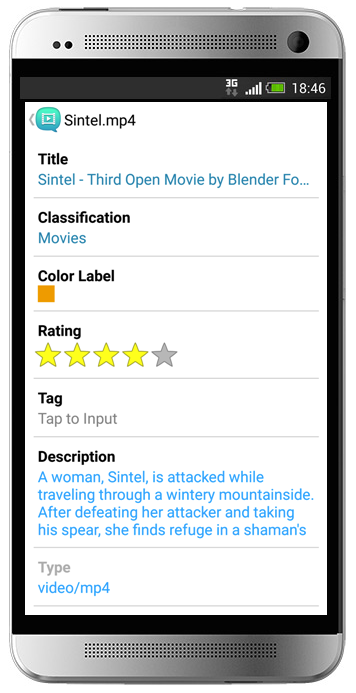 Organize your videos by category, tags, ratings, or labels for a clearer display and easier searching. 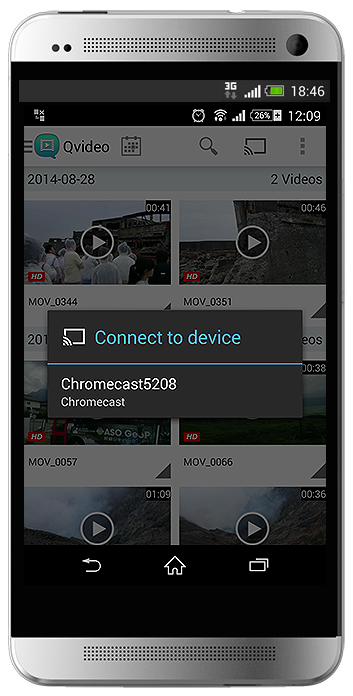 Stream videos stored on the Turbo NAS directly on TV via Chromecast device. 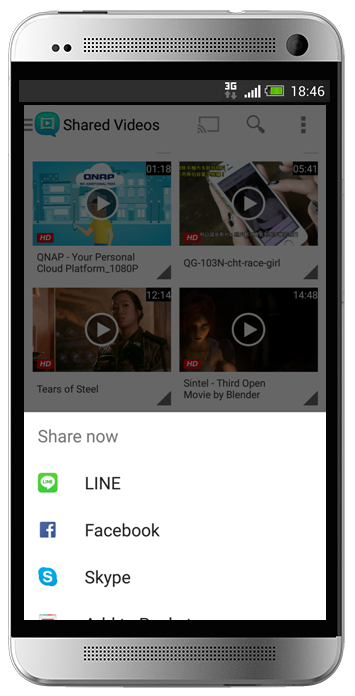 Share interesting videos with family and friends via email, message and social networks. Qvideo supports Qsync, a handy service that synchronizes files between Qsync-enabled devices/applications and a Turbo NAS, making it ideal for frequent travelers to access and share the most up-to-date files. 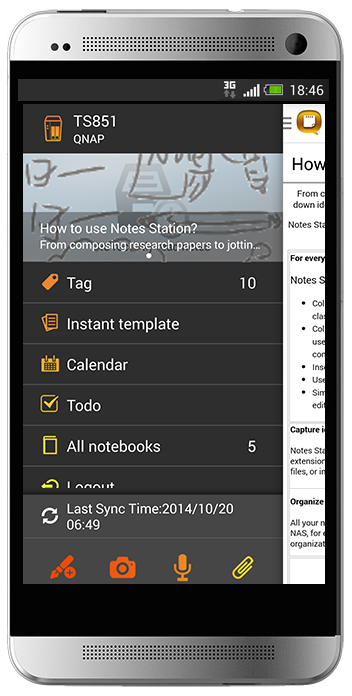 A handy mobile app for taking and sharing notes on the go. Synchronize your notes with the Notes Station on your Turbo NAS, or save notes offline. 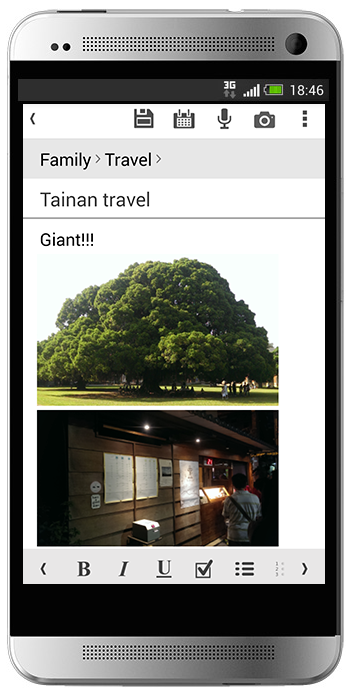 Insert photos, audio, and videos saved on your mobile device (or from its camera and inserted SD card) into your notes to enrich the contents. 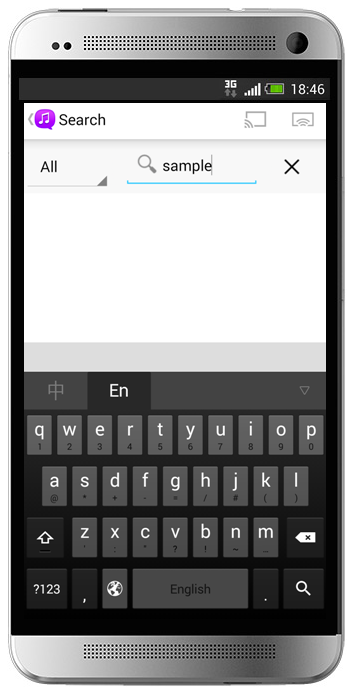 Invite other users to read or edit notes for productive communication and teamwork. 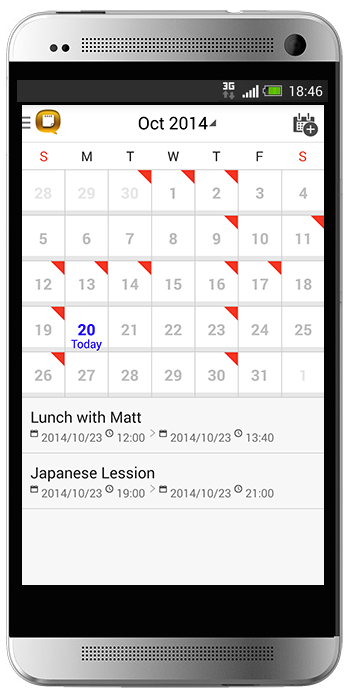 Create meeting minutes with templates and quickly add calendar events and to-do lists. 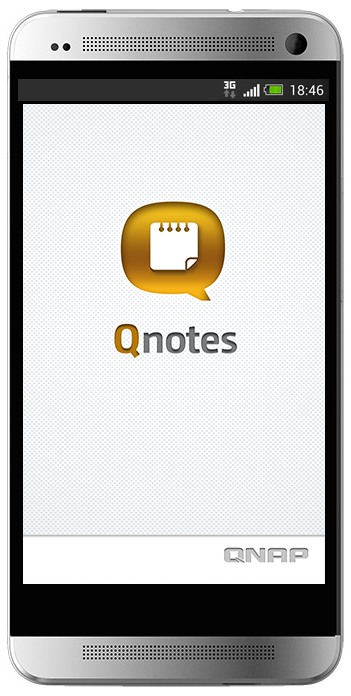 All of the events and to-do’s from different notes are integrated in one place for easy access. 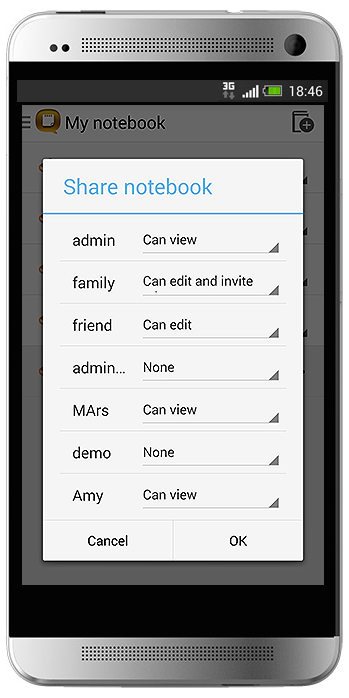 Easily share your notes with a sharing URL via social networking sites or messaging apps. Open notes you’ve read recently for quick recollection. 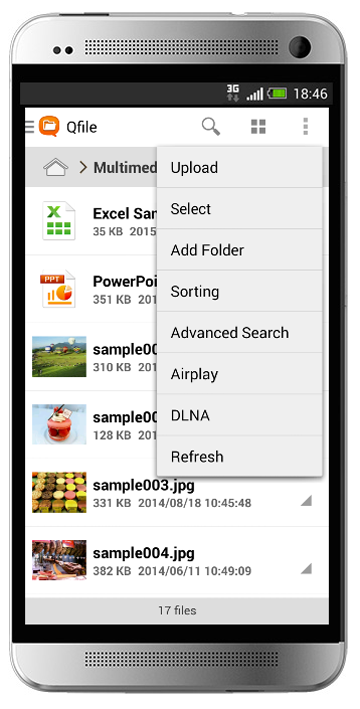 Easily search download sources, download contents to the Turbo NAS, and manage download tasks on mobile devices. With the inbuilt Internet browser, you can add tasks with a direct download link (HTTP/FTP/Magnet link) to the Download Station. With a simple tap, you can back up YouTube videos to the Turbo NAS through the HappyGet*. 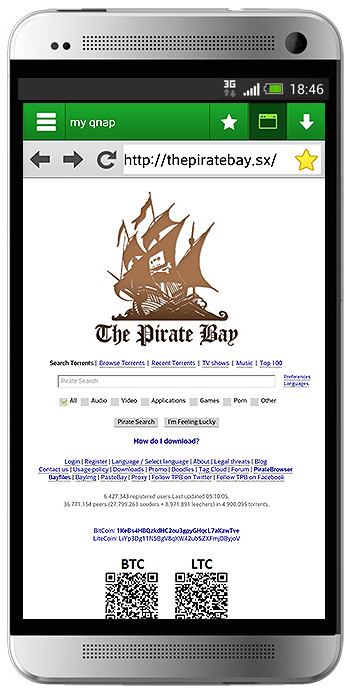 Search desired torrent files in a few seconds and add them to the Download Station. Quickly overview the status of all download tasks, or remove any unwanted task. When a download task is completed, you will receive a notification from Qget. 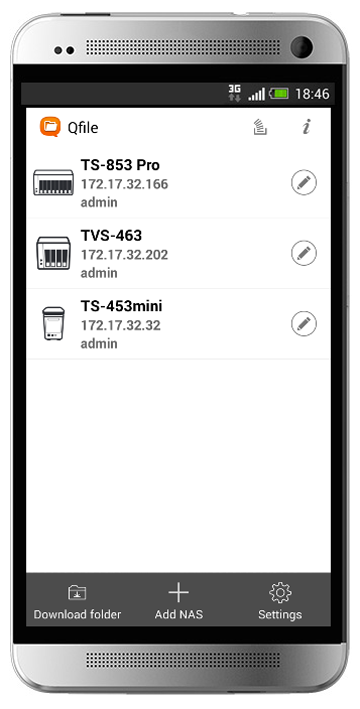 Vmobile is a mobile surveillance app for remote and wireless monitoring of IP cameras managed by the Turbo NAS with Surveillance Station or the VioStor NVR. 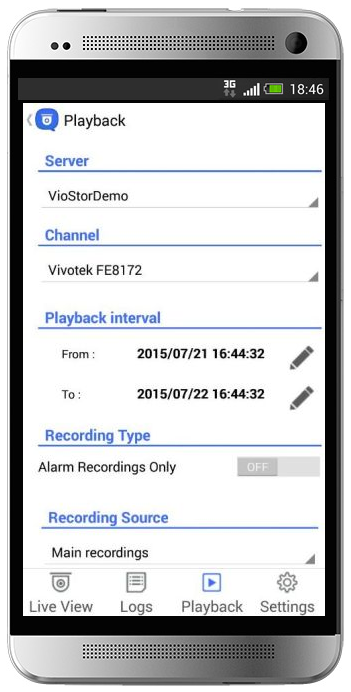 Access surveillance system to manage and monitor IP cameras anytime, anywhere. Create multiple profiles with different sets of VioStor NVR/Turbo NAS and IP cameras, and efficiently switch between different monitoring views from the profile list. 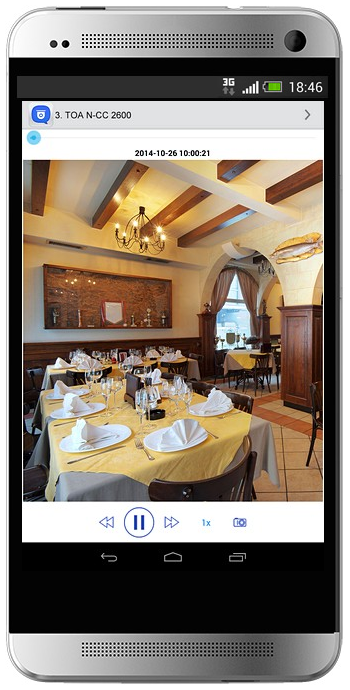 The PTZ (Pan/Tilt/Zoom) cameras can be controlled directly on mobile devices. It’s easy to adjust the monitoring angels and preset monitoring position. When an event occurs, Vmobile can notify by ringtone or vibration to keep you alerted immediately. Slide on the timeline to conveniently play back recorded videos. 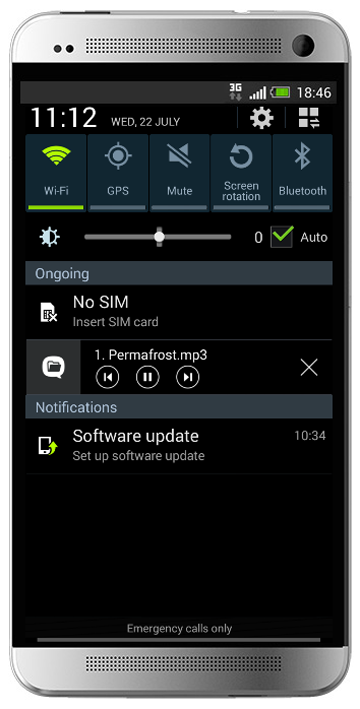 You can also choose to play back alarm events only for quick review. Search a specific video section by date and time, quickly and precisely. 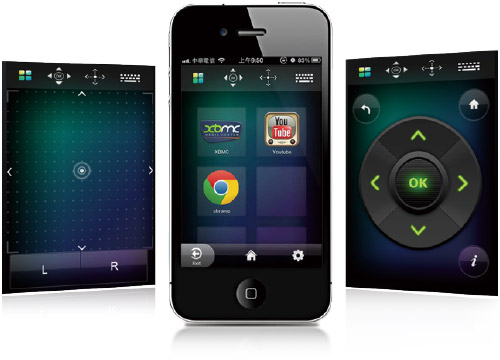 When enjoying the HD Station, rather than hardware remotes, Qremote app is so convenient to make your mobile devices as a handy remote control. Control playback of videos, music and photos stored in the Turbo NAS remotely and enjoy them on TV without additional gadgets like a controller, USB keyboard or mouse. 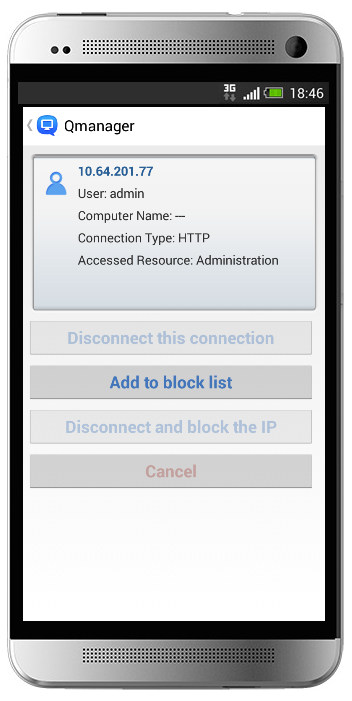 Enjoy the convenience of switching among applications including XBMC, YouTube, Google Chrome, and MyNAS (Turbo NAS web portal) with ease.